Spring is in the air and the mind turns to new beginnings. Spring begins on Friday, March 20th. The vernal equinox is a time of renewal as days get longer and we gain more light until the summer solstice. Bulbs are poking out of the the ground and tree tips are greening. The air even smells like growth. After a grueling winter, the sun’s warmth is a blessing. However, more light reveals layers of dust and grimy windows. 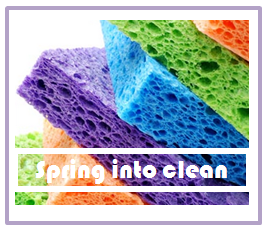 March is a good month for spring cleaning and airing the house as the heating season winds down. While I like the house orderly and clean, I don’t want to waste time inside when Goldilocks conditions reign outdoors. It’s not too cold, not too hot, and mosquitoes have not yet appeared. IndexCardCure™ has solutions for having a visitor-ready house without spending all day cleaning or hiring someone to maintain it for you. Being outside replenishes and revitalizes, so we want efficient house cleaning rituals to maximize our time in nature. Lose before cleaning. Take a look at your rooms with a critical eye. Does your stuff own you?Just like pruning is beneficial for tree health, pruning your possessions makes tidying easier. Here’s a radical idea. For everything new, get rid of two. For every non-consumable you bring into the house, eliminate two other items. Removing items doesn’t necessarily meaning trashing. Re-use, donate, or recycle, if the items warrant. As my spiritual director put it, “The shirt I’m not wearing belongs to the poor.” Don’t keep what you can’t use. Keep work areas usable without needing to clear before you begin a project. As much as possible, keep horizontal surfaces uncluttered.Store vertically on shelves or inside drawers or cupboards. At least, contain tools and supplies for particular projects in bins. Have a place for everything and everything in its place. Don’t waste life energy searching for misplaced essentials, like keys, phones, or purses. Have a landing pad for critical items. Store things where you use them and get in the habit of returning items to the same place after use. For example, after unloading groceries, return shopping bags to the car or keep books in a bag to bring to the library. Cleaning is a breeze if your stuff is minimized and stored, Swipe surfaces, appliances and even windows and mirrors with a damp microfiber cloth. Work in sections, such as cleaning the sink after brushing your teeth or tidying one drawer when you pull out the charger for your phone. Base priority for pruning and cleaning on the one area you find most annoying or the rooms where you spend the most time. We all have our seasonal traditions. Even though the weather is warmer, you may want to wait before storing sweaters and changing out quilts. Snow may not be in the forecast, but freezing temperatures may still appear. March promises no guarantees for consistent warmth, but a clean sweep and sparkling windows bring a breath of fresh air.